Courtesy of the data-wizards at Overflow Data, we’ve learned a lot about America. The statisticians have fine-tuned our understandings of when the denizens of this country get to work in the morning, get married and how much they spend on rent every month. But what about childbirth? There’s a topic Overflow hadn’t broached, until now, that is. 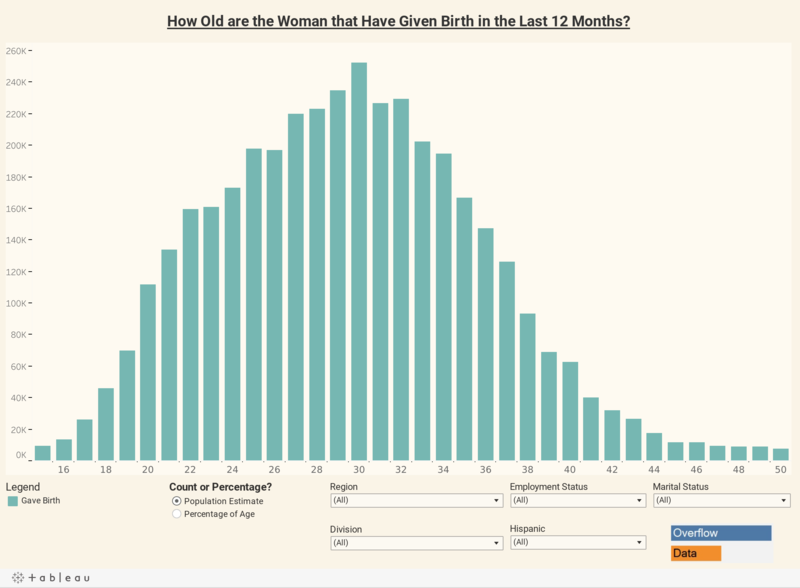 Using data from the US Census Bureau’s 2015 American Community Survey, we get a sense of the age that women are most likely to become mothers. Note, this isn’t indicative of the entire country at large, as the sample reflects the most common age of women surveyed by the ACS who gave birth in 2015. Citing respondents between the ages of 15 and 50, the survey found that 30-year-olds had the highest number of new mothers, with 11.06% of women this age giving birth in 2015, according to the ACS. Mothers between the ages of 27 and 33 formed the crux of new mothers in 2015, which isn’t unsurprising, considering the most common age of newlyweds. Shockingly, as if biology is an imperative to no one anywhere, 7,696 50-year-olds also had their first kids in 2015. If you’re interested in learning more about your fellow citizens, check out Overflow’s synopsis of American education, because it's pretty intriguing.